Are you interested in ways to keep the water in your pond clean? If you have any type of pond like a tub or a plastic insert, then algae build up might be a problem. 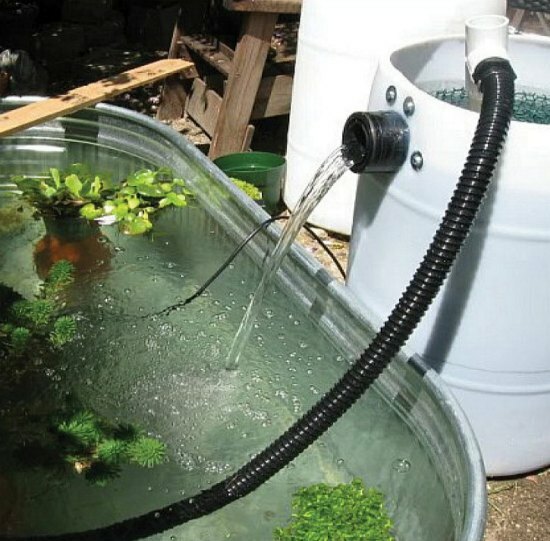 The best solution is to set up a DIY pond filter to help keep pond scum and algae to a minimum. The most important thing to know about a DIY pond filter is the cost is much less than having to buy a commercial filter. PVC piping is the main material you will use for this project. You can find what you will need for this project at a local hardware store. A 55 gallon food grade barrel will also be needed to make a DIY pond filter. All of the parts and pieces need to be connected to the barrel to make the filter. Simply turn on the filter once you have all the pieces in place.